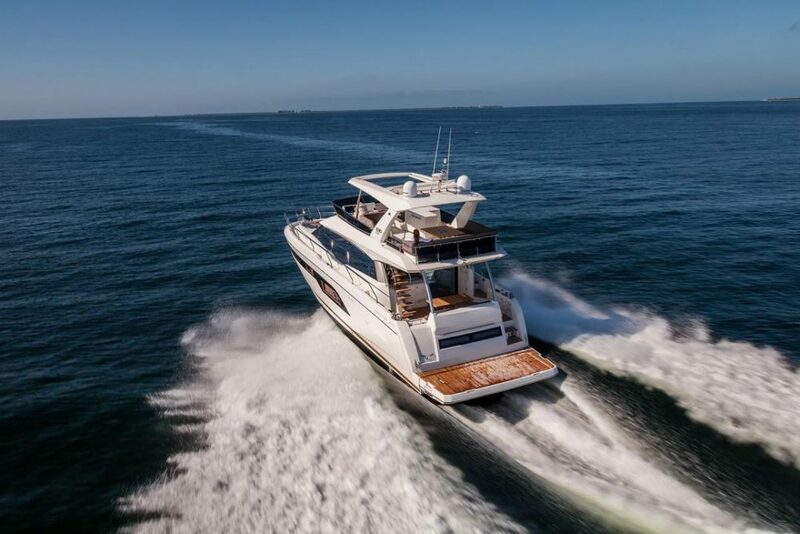 The 2018 Prestige 630 Flybridge model is certainly a yacht worthy of her category—although one of the smaller models in the line, it doesn't lack superyacht style. 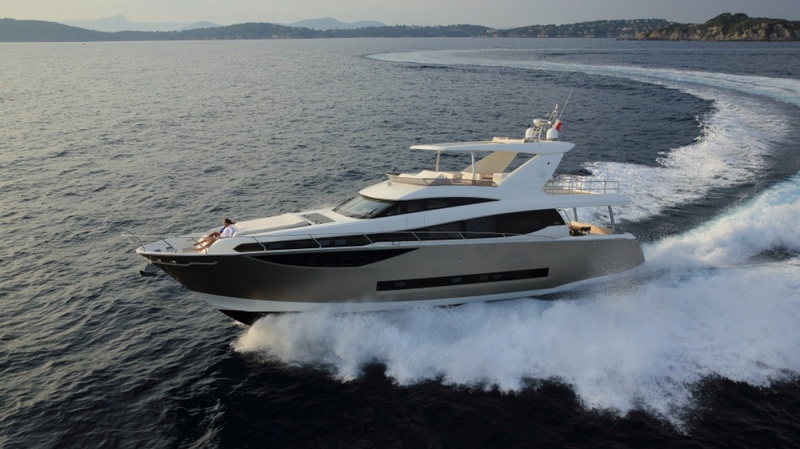 PRESTIGE is a builder of luxury motoryachts 42-75 feet and the French company has launched more than 2,500 yachts over the past 20 years. 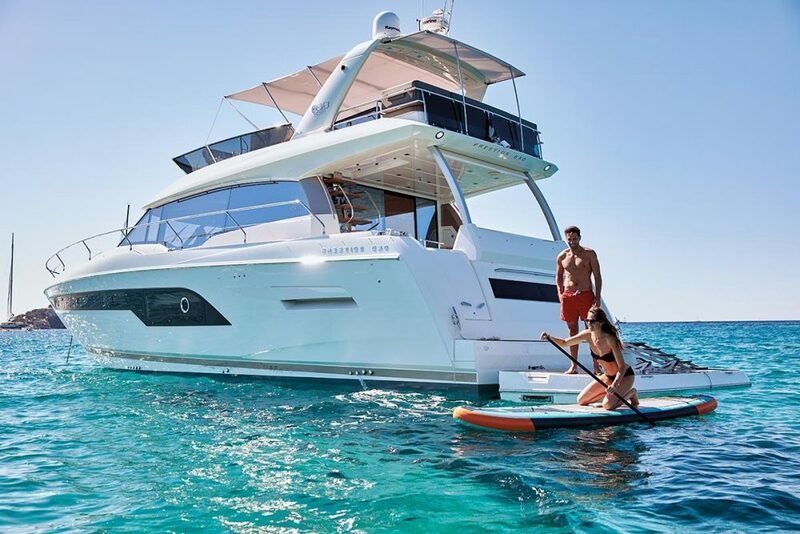 Technically the smallest of the company’s “yachts division”, the new PRESTIGE 630 has two larger models above in the line but she feels like a compact superyacht herself. As we tested her on a 90-mile run on open ocean, it became clear that she lives up to her positioning and has luxury and performance in spades. 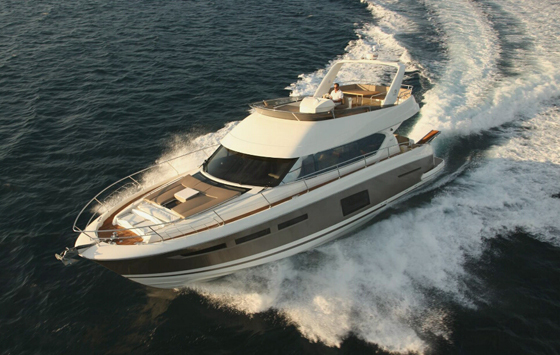 Looking for the most affordable mini superyacht on the market today? You may have found it with this new PRESTIGE. 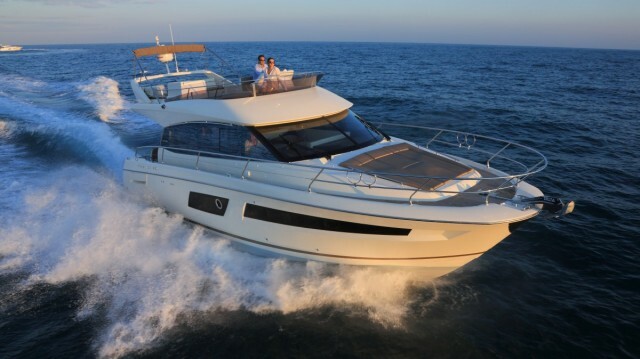 The 630 is available as both a flybridge and sport model. The flybridge is shortened and pushed aft. This allows the addition of a sunroof in the salon but still accommodates a social area and a second helm up top. 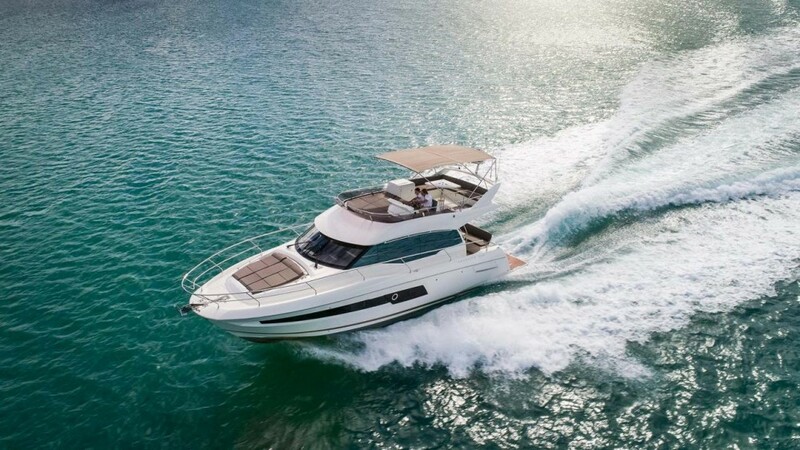 The helm has twin 16-inch MFDs, a Volvo Penta engine display, the bow thruster control and pod joystick on the dash and everything feels right at hand. To starboard is a sunpad large enough for at least two and a double seat just like the one at the helm. The driver need never feel alone with so much companion seating. The flybridge hardtop runs from these two seats aft and has an integrated fabric sunroof so on those days when the weather is glorious and you’d rather not have a roof, you can opt for the convertible feel. An L-shaped dinette is all the way aft and wraps around a solid wood table. In between is an optional outdoor galley with a Kenyon grill, a Dometic refrigerator and a plenty of countertop space. Once the food and beverages are brought up here, the al fresco dining and view will be the envy of the anchorage. Six steps lead down to the aft cockpit where an optional third steering station may be added to starboard. However, with the other two helms aboard, it’s not really necessary and doesn’t add much to visibility when docking. A transom seat and a table with integrated stainless steel cup holders are aft and a refrigerator and optional icemaker are tucked below a Corian counter against the glass door and window, which lead to the interior. 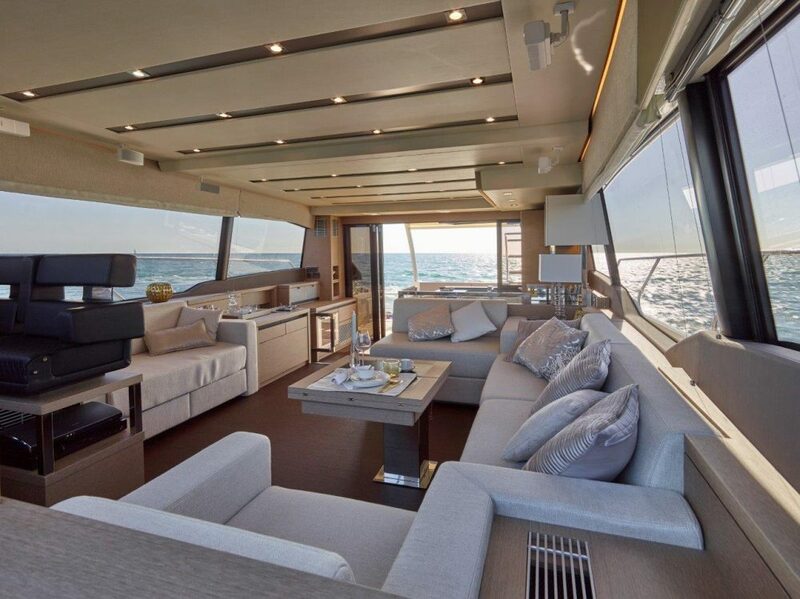 You'll find plenty of room to entertain both outside and on the interior of the 630 Flybridge. A 5’x 8’ electric fabric awning deploys from the flybridge overhang out toward the hydraulic swim platform. The teak beach has a set of flush-mounted stairs that pop up when the platform is lowered and they make coming up or down easy. Moving toward the bow, steps lead up to the side decks where the cabintop has been angled inward, providing more shoulder room as you walk forward. On the bow, a triple-wide sunpad takes up most of the foredeck but there’s still room for skylights on either side. These bring lots of light down to the forward stateroom even when the sunpad is occupied. A cabana at the head of the pad provides shade while a four-seat forward-facing settee is at the foot providing seating for a four more. 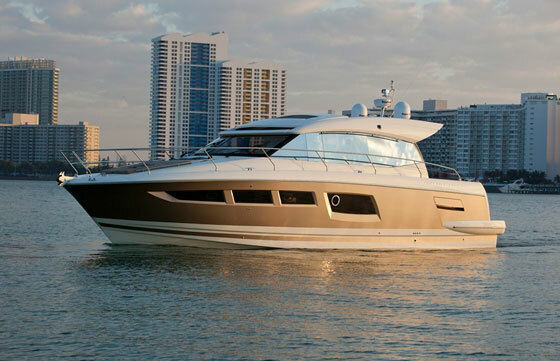 On their larger yachts, PRESTIGE has a signature floor plan. The master stateroom is aft and has its own staircase. In this layout, the owners enjoy their privacy, separated from both guests and kids in the forward section of the boat. Across from the galley and behind the starboard settee, eight steps lead down to this luxurious, full-beam master with a centerline queen bed and a portside lounge. To starboard is a vanity desk and the master head with a wide sink and a smallish shower stall. The owners won’t need to leave much left behind because the stowage space here is significant with two hanging lockers and plentiful drawers throughout. The headroom and the length of the master berth are both 6’6” and PRESTIGE added luxury touches with a 60-inch flatscreen TV and a backlit, fabric-covered headrest that provides a soft glow throughout the cabin. Family and friends will be accommodated in their own ensuite cabins including the VIP stateroom in the bow and a third cabin with twin beds. The main deck has an inviting great room. The galley is aft to port so it can easily serve both the interior dinette as well as the cockpit. The chef will delight in a ceramic 3-burner cooktop with a separate oven at knee level, a standup fridge and freezer combo and an optional dishwasher in the aft corner. A center island holds dishes and with its integrated, leather-wrapped handholds, provides a place to steady yourself in a seaway. 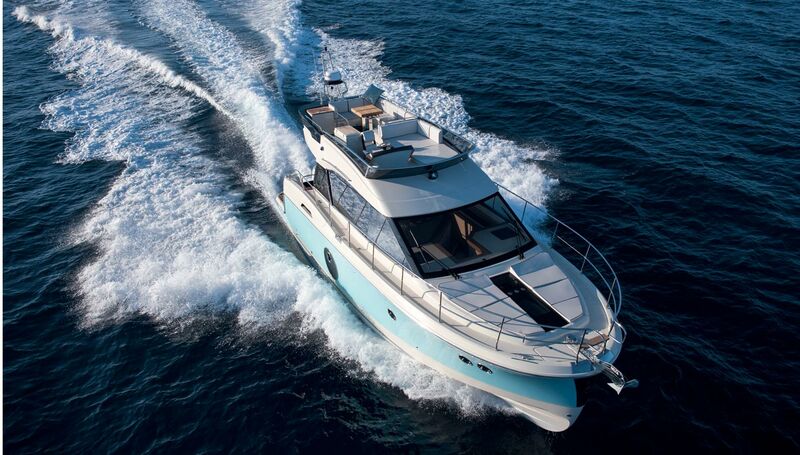 You'll find no lack of comfort onboard with generous living spaces and a three-cabin layout. The salon has 360-degree views through windows that may be among the largest in the industry. Lights, climate control and various pumps and systems are controlled via a Scheiber digital switching panel that adds to the minimalist aesthetic and clean lines of the interior. Who needs all those switches when you can do it digitally? With seven feet of headroom in the salon, even tall boaters will be comfortable. The vessel feels roomy and light throughout, which is also helped by the 31 lights embedded into the headliner of the main deck. The main helm is to starboard and has three 16-inch MFDs (Raymarine gS165s) on a good angle for the driver and a Volvo-Penta EVC display on the lower dash. The pod joystick, bow thruster joystick and engine throttles all outboard beneath the side window. Both port and starboard side windows may be opened with switches at the helm. The cross breeze this creates is lovely. The starboard window also lets the driver communicate with those on the bow or the dock when mooring or berthing. Two cup holders are inboard of the wheel and the dash is covered with a matte paint that cuts down on glare from the windshield. On our run up the West Coast, we found the best cruising speed at 22 knots and 2200 rpm. At wide-open throttle and slightly over 2500 rpm, the 630 reached 28 knots and came on plane in 8.3 seconds. On the PRESTIGE 630, the engine room is accessed via the swim platform. A transom door leads to the optional crew quarters with twin berths and a small head that also serves as the walkthrough to the machinery space. Twin 725-hp Volvo Penta IPS 950s are coupled with pod drives, a combination that delivers better fuel economy and greater performance with less horsepower and weight. A 21.5 kW Onan genset is on the centerline forward above the optional SeaKeeper gyrostabilizer. This is a proper engine room with excellent access to all systems. Powered by twin Volvo IPS 950s, the 630 delivers better fuel economy and is much quieter—even while running. 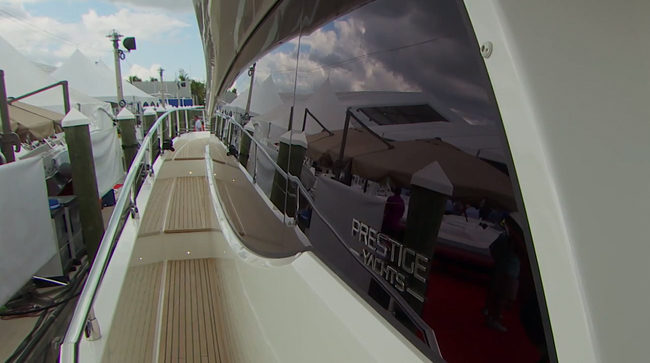 Besides the separated layout, PRESTIGE has also made its mark because the boats are so quiet, even under way. The hard-chine hull has a deep entry that slices through the waves but then tapers off to a 16-degree deadrise aft so the boat rides smoothly. The hull was designed from scratch to accommodate pod drives so this isn’t just a retrofit with a funky propulsion system shoehorned into an older design. 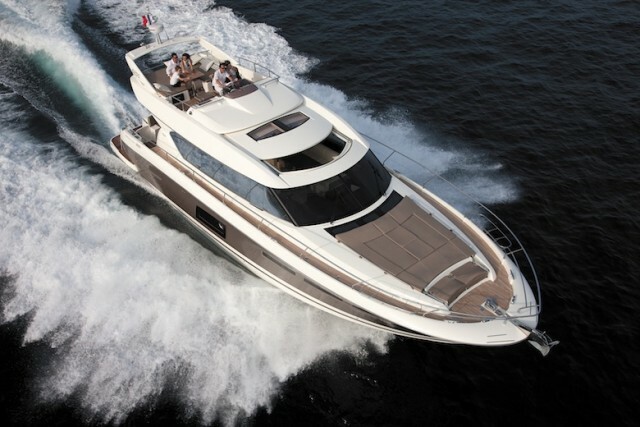 At just under 63 feet LOA, the PRESTIGE 630 feels bigger than 63 feet. She has lots of get-up-and-go but with her fuel-sipping engines, she won’t drain the wallet. Luxe details touches and smooth ride, it’s no wonder she’s in PRESTIGE ’s “yachts division” and at $2.6 million, she may be the most affordable mini superyacht on the market today. 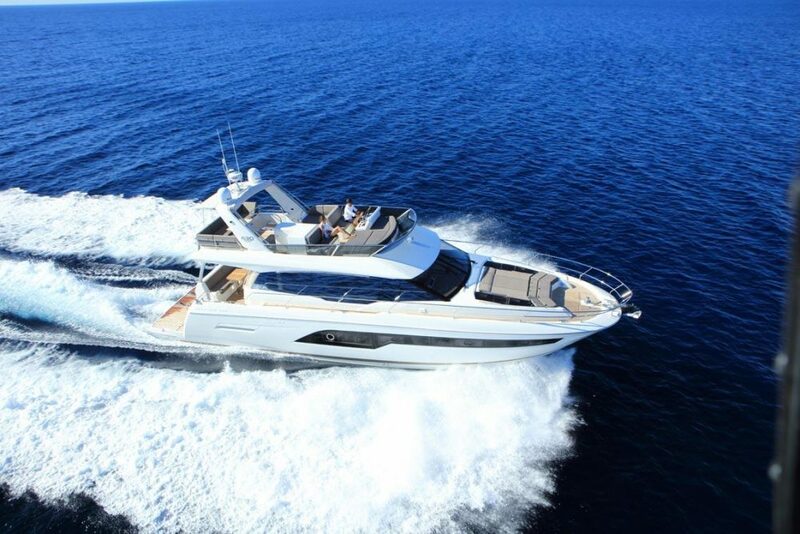 See PRESTIGE 630 Flybridge listings.